Love all outfits, casual and stylish. Great for summer time. Everyone looks happy. The outfits are spelling summer holiday's great look for all. These outfits on the girls look great very age appropriate, unlike the dresses they wear. The dresses they wore yesterday were perfect for their age. Totally agree, Maria. Girls' dresses yesterday were lovely and entirely appropriate summer wear for the girls. Everyone looks cool and comfortable today. I agree with Unknown 8:52. The outfits today are supercute AND age-appropriate, whereas the dresses from the photocall the other day were way too young for them. I do not want children to look older than they are, and I´m not suggesting to dress them like adults. But to dress preteens like preschoolers is wrong too. All the ladies look great! Whether in their dresses or shorts, the girls look nice and appropriately dressed for their ages. 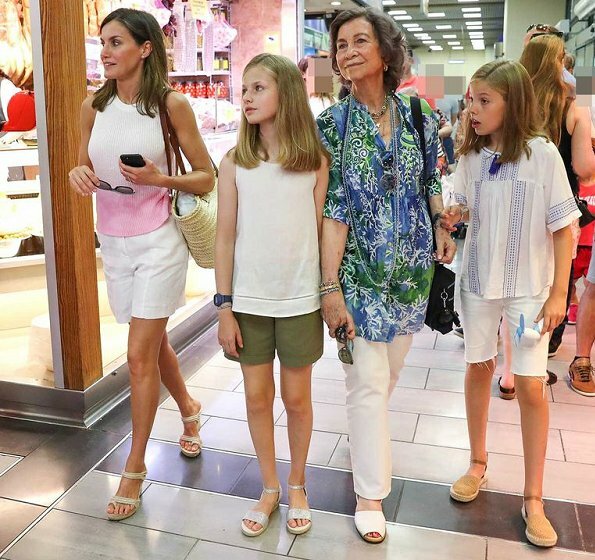 Love Letizia's shoes and the blue/green colors are pretty on Sophia. Nice, summery and relaxed. Nice to see them enjoying themselves and the sites. 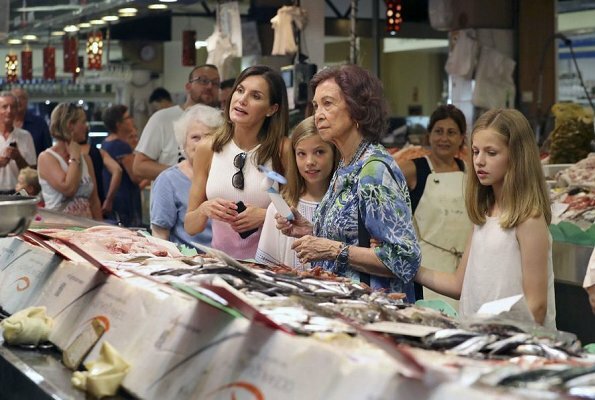 Sí, fantástica la visita a la pescadería. Cada vez que vayan de vacaciones, es lo mejor y principal. Ya lo has dicho 3 veces, escondida en el Anónimo, so plasta clasista. ¿No te aburres de hacer el ridículo? Sobre todo si eres del norte y te gusta el pescado..las catetas y paletas q no han visto el Mar, solo comen patatas bravas.. If it's RL, the family is beautifully styled and coordinated. Sofita's boho chic is endearing. Grandma in picture #4. Free Leonor!! I hate to say it, but Queen Sofia looks like she must be the center of it all. All are nicely dressed of course, but she is "working it" for all it's worth with the photographers. Maybe I am reading too much into these photos? To me it looks like she is pushing herself between the two girls. And again she tries to grab their hands. I agree 100%. I dislike the way she "clamps" onto the girls and then moves to the front, it is like she is trying to show up Letizia. Something is not right there, not sure what it is, but something is not right. Nevertheless, the kids and their mother are lovely looking and must have been glad when it was over. KH .... I'm not so sure, you hate writing what you think! And maybe it's all a result of the controversy that was earlier about this ? Coralie, Mildred P. ? ;-) In the European culture, I've grown up in, it's quite normal to hold a beloved grandmother in one's hand. Queen Sofia is almost 80 years old and may need one to lean on as she walks around ??!! She also looks tired in the summer heat! Coralie and Mildred Pierce, I agree. Everybody look good. But how tense Letizia is. That Easter case must have been really a very big misconduct so that she still needs try to belie it. Letizia somehow always manages to make low cost look chic. I do not see her as tense but it must bot be a good feeling in her position. It looks like the children belong to the crown and she is only their mother. The Easter incident happened because someone did not follow the usual protocol and took everyone else by surprise. Even worse is the person who tweeted it to the world 2 days later for no good reason. Poor Leonor now has to dangle on Grandma's arm and is totally expressionless. The look of surprise on little Sofia's face at whatever she is seeing is adorable. 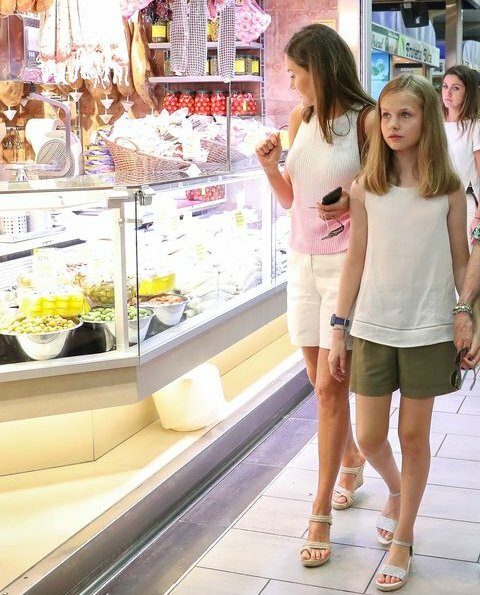 The way Sofia grabs Leonor's wrist shows clearly that the miscoduct at Easter was hers, not Letizia's. Ich verstehe gar nicht, warum die Mädchen ihre Oma an die Hand nehmen müssen. Kann Sophia nicht alleine laufen? Das sieht doch mittlerweile albern aus. Mit fällt das auch unangenehm auf. Ich finde es unangebracht und übergriffig. Man kann auch sehen, dass die Mädchen es nicht mögen, besonders Leonor dreht sich immer weg, schaut oft hilfesuchend zu ihrer Mutter. Ich habe auch nie gesehen, dass beispielsweise Königin Sofia oder Königin Sonja sich so übergriffig verhalten. Sofia glaubt immer noch die einzige rechtmäßige Königin von Spanien zu sein und hat ihre Schwiegertochter nie akzeptiert. Man kann die Anspannung bei Letizia förmlich spüren, wenn ihre Schwiegermutter in der Nähe ist. Wenn sie allein oder mit ihrem Mann ihren Repräsentationsverpflichtungen nachgeht, ist sie viel freier. Das war besonders zuletzt bei der USA Reise zu sehen. Beth, thank you for these words. I have often felt the same for Letizia with her mother-in-law around. Wish Sophia would realize this does not help Spain. I totally agree with Anonymous and Beth! >>Wish Sophia would realize this does not help Spain.<< So right! And even more she drives a wedge into the marriage of Felipe and Letizia and makes their family life unnecessarily difficult. By the way, in my post above I made a mistake, I wanted to say:>>Ich habe auch nie gesehen, dass beispielsweise Königin Sylvia (nicht Sofia) oder Königin Sonja sich so übergriffig verhalten. Bonitas fotos. 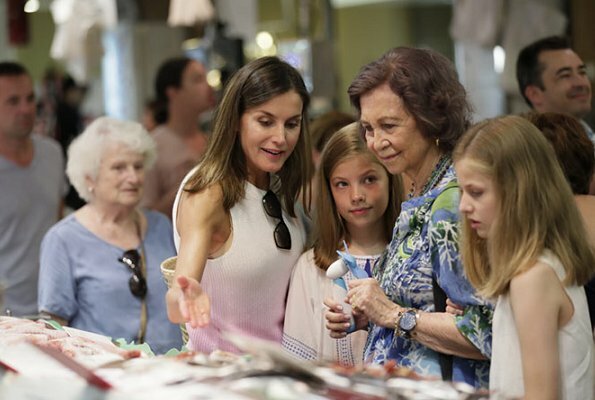 Una salida muy propia de Letizia, siempre tan preocupada por la alimentación sana. Las pequeñas princesas serán unas jóvenes muy bellas, vestidas de sport o con vestidos formales. Fantástico el posado royal en la pescadería, en Palma, donde hay paisajes preciosos, mar vela, etc, lo mejor es la pescadería. ¿Te has perdido las fotos de la Almudaina, del Club Náutico o únicamente quieres jorobar? Esto es PISAR CALLE de verdad, no las tonterías de los sitios pijos, que parece que es lo que a ti te va. Se siente. Hay Royals que limpian de basuras calles o playas y tampoco es algo vergonzoso. Se huele el clasismo desde lejos. Estan muy lindas, se huele el pescado tambien ! Very fabulous Spanish royal ladies. Todas las mujeres de la casa en la pescadería (la abuela de Leticia era pescadera)y el hombre (el rey),surcando los mares. Viva la modernidad! Ay, qué graciosaaaaaaa. ¿Te crees moderna tú recordando ancestros humildes? Yo diría que más bien eres de género Peñafiela, apestando a naftalina. Lo siento por ti. Pero qué manera de hablar (o escribir) es esta. I Do agree with abovementioned reactions concerning the unnatural performance. But you'll see, in a little while the 2 lovely girls will refuse this cinema and put things right.. 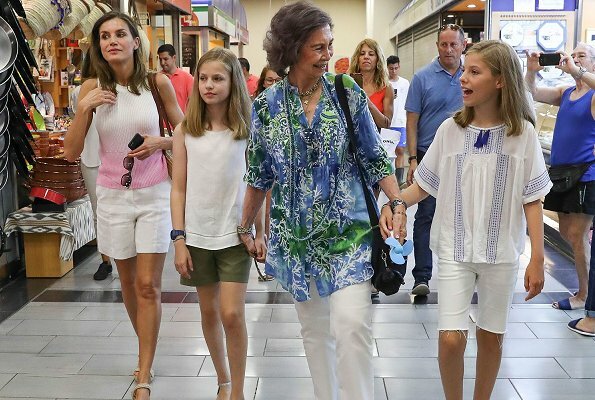 I don't know why but everytime I see photos of Queen Sofia holding the girl's hands, I feel a little uncomfortable for them. It's like she is forcing them to hold her hand. Or her grip is to tight. El pueblo, y Mallorca quieren mucho a la Reina Sofía!! Everyone is well dressed for the summer. The girls are starting to express their individuality by branching out with their choices for clothes. Lenore has the quiet look in her beige shorts and white sleeveless top whereas Sofia has a more lively look with her cut off capris and blue trimmed blouse. Also they have made it so the girls can be recognized as who they are with Lenore's hair being a bit longer than Sofia's. We are lucky to have the opportunity to watch these two lovely girls grow up and take their place on the world stage. I share the other readers' discomfort at the way Sofía grabs the children and her obvious need to appear before the press and the public as the central figure in the girls' lives. 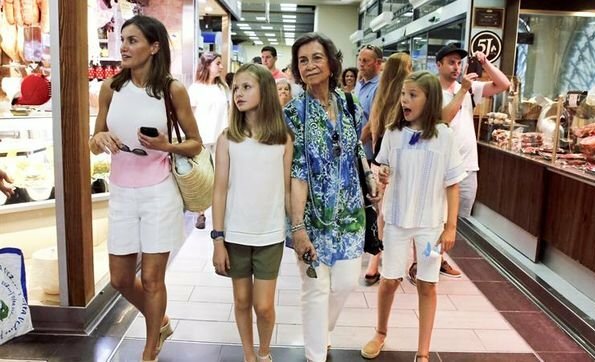 There is a term in Spanish I love, "ningunear," to be treated as if one is no one, and this is what Sofía seems to do to Letizia in their public appearances with the girls, Sofía is front and center, the girls are grabbed on for dear life, and Letizia is relegated to the margins. As a mother this would really annoy me--as a mother and the actual queen, it seems to drive Letizia to distraction. The girls are clearly uncomfortable. There is a marked contrast between these photos and the ones from earlier this week, when the girls were with their parents and encouraged to walk on their own and speak freely to photographers. I got a chuckle out of an earlier comment encouraging us to start a movement to Free Leonor! I totally agree with you Lisa. 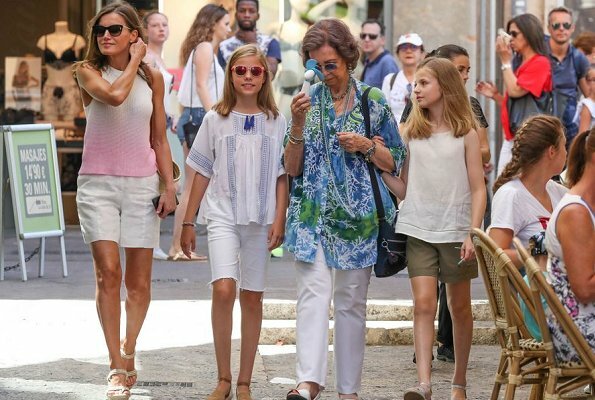 Sofia thinks she's still the queen and Letizia has to take it to avoid problems. She keeps on grabbing the girl's arms and hands instead of letting Letizia take care of them, as they are old enough to walk on their own. Having said that, they all look very nice and summery. There are pictures of the whole family out at a concert this evening. Everyone is nicely dressed and of course color coordinated. Leonor again being towed along by Grandma. This girl in theory is being trained to meet world leaders, politicians of all stripes, heads of NGOs etc. and Grandma will not let go. Free Leonor!! Las niñas están mal porque las han llevado a la pescadería. Es la primera vez en 15 años que salen con su abuela Sofía...gracias al comportamiento de Letizia en Palma. Please do not invent. Google has several pictures of the children out with their Grandmother over the years. The last one was 2 years ago when they were out sailing and with the rest of the family at a restaurant. 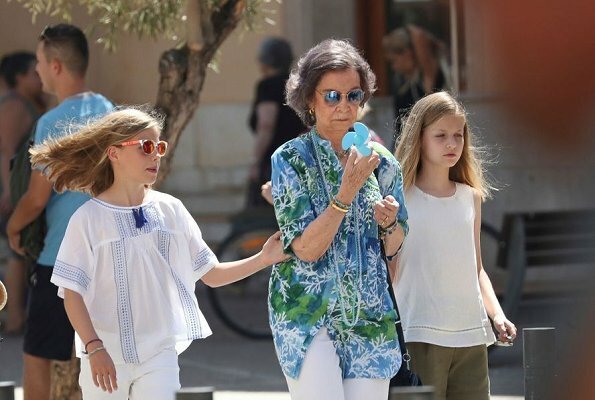 Sofia's capriciousness in Palma has worked in her favour but the collateral damage done to the girls is real. Las catetas de pueblo no van a la pescadería...ja!!! Sofía vive ente Londres y Atenas hac 20 años, por eso es difícil q vea a las niñas..
@ 9:39 This is called a teachable moment. Mothers of many species usually teach the young ones where their food comes from. The same ones who complain about paying for their upkeep, demand to see sailing and swimming and other pijo sports. Credit this mother with teaching the girls practical things. I agree, I could not have said it any better-on point. Yo veo que todas estan muy bien vestidas para una divertida y casual salida. I try to avoid biased opinions and be open-minded. Jusice can not be one side alone, but must be for both. Totalmente veraniegas.Letizia demuestra que es una mujer moderna de nuestro tiempo. No es ningún posado. Han salido a dar una vuelta y posiblemente las niñas no han tenido la posibilidad de ver una pescadería como nosotros la vemos a diario. Let them hold hands; people speculating that this would be a problem for them is probably more of a problem that the hand-holding itself... Concerning the sartorial side, I feel that these two girls are the most appropriate dressed young royal kids we have: never over the top, looks comfortable and right for their age. And no make up. At long last! Leonor and Sofia wear "Bermuda" pants/shorts, and tops, which is what all girls, and young women wear, when relaxing/ and on holidays. Now I hope Mathilde's children, also Leonor will follow suit. And yes, I can also almost literally feel the tension between Letizia, and gran Sofia, and if she needs support, why not asking Letizia to support her under an elbow, or she can walk with a crutch. Again, I just LOVe the 3/4 pants, and shorts!!!! Pictures of previous years show the little girls in shorts. The visit to the farm (maybe in Dad's first year as king) and in the years before that too if you care to look. "All girls and women"?? Staged pictures do not reflect the childrens' entire summer. Mom always knows best. 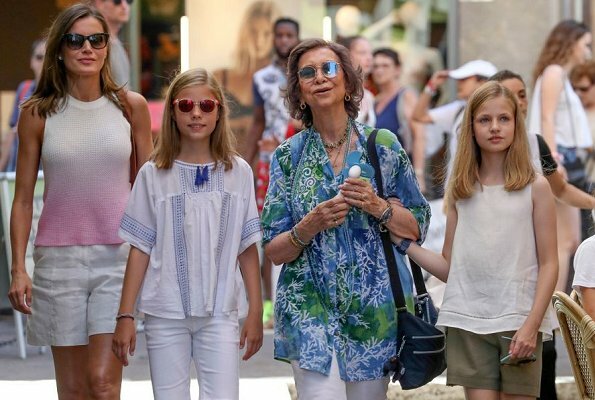 Letizia and her daughters look great!